Anti-fracking campaigners say they have “not even started fighting yet” in their campaign against Cuadrilla. 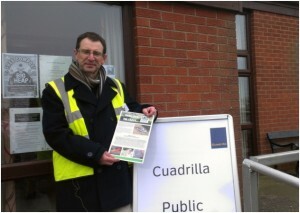 The newly-formed Roseacre Awareness Group (RAG) has made the claim after energy company Cuadrilla held a public information event to discuss its plans for the village with residents. The energy firm is looking to explore sites in Roseacre and Little Plumpton. Barry Warner, from RAG, said: “What we’ve got at the moment is a classic case of David and Goliath. A shale gas supply chain report, revealed at a conference on the Fylde coast, estimates the industry could be worth £33bn to the UK. The report was unveiled, and measures to minimise the environmental impacts of shale gas have been announced, by the Government.